Favourite Orchestra led a 50-1 treble for jockey Ryan Moore as he took victory in the Chester Vase for trainer Aidan O'Brien. Orchestra's success was O'Brien's fifth win in the last eight runnings of the Group Three contest, which is a trial for the Derby at Epsom next month. The 3-1 chance held on to beat the John Gosden-trained Romsdal in a photo finish, with Scotland third. "He travelled around beautifully," said Moore of the winner. "He's a big, strong horse and it's only his third ever run. The ground was probably a bit too loose for him, but it was a perfect trip and I was on the best horse." 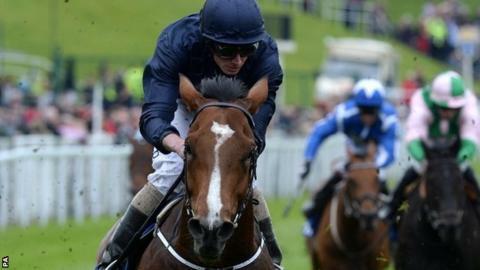 O'Brien's previous winners in the Chester Vase include last year's Derby victor Ruler Of The World. Orchestra's price for the Epsom Classic was cut by bookmakers to 20-1 from 40s. Stablemate Australia is the 6-4 favourite. Moore went on to triumph with Legend Rising (6-1) in the Boodles Diamond Handicap and 5-6 favourite Ballymore Castle in the maiden stakes.